Another milestone! We got the engine out of the car! It turned out that pulling the engine wasn't all that difficult. In a Locost, the engine is already halfway out of the car as soon as you take off the hood. You just need a way to suspend a 400 lb. powerplant in mid-air, and you're good to go. Unhook a few wires and cables, pull two coolant hoses, unbolt the transmission and motor mounts, and lift away. If you forget to disconnect something, no problem, it'll just tear off and then all you have to do is replace it. We got lucky and nothing tore off. Engine not as rusty as it looks here. Lighting. We had to take the engine out by itself, without the transmission attached, which means we finally had to take the engine and transmission apart. It wasn't as bad as we thought, but we did have one minor issue. All but one of the 3" long bolts connecting the engine and transmission couldn't be extracted from the transmission housing because various frame rails were in the way. We were able to remove the nuts from the bolts, so the engine wasn't trapped in there, just the bolts. Still, pretty unusual for us to have unexpected clearance issues. It wasn't a big deal, though. 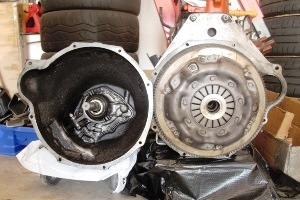 Once the transmission was disconnected and moved forward, the bolts came right out. We just have to remember to insert the bolts into the transmission next time we go to re-install it, which is doubtful, but worst case scenario we'll lose about 2 hours installing the engine next time. And probably the time after that. We'll of course add this bit of information to our workshop manual, although that won't be much help because as I think we've mentioned before we're not very good at reading directions. All of the clutch components looked really good. I was surprised to see a real roller throwout bearing inside the bell housing, instead of the traditional graphite ring. I'm not sure it's possible that by 1972 M.G. had figured out the advantages of ball bearings, and Moss Motors still sells the graphite version for that model year. In which case this would be some kind of aftermarket unit installed by a previous owner. Another bargain from our $1000 donor, thank you very much previous owner. 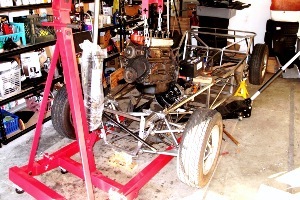 Once the engine and transmission were out, removing everything else from the chassis was a piece of cake, except for the differential, which came out as easily as it ever did, which it never did because it's big and heavy and doesn't really want to fit between all those tubes back there. Some parts on the car weren't completely bolted down, or bolted down at all, so those were easy to remove. The suspension came apart just as quickly for similar reasons. As we took everything apart we were careful to save all the bits and pieces in little plastic bags so we wouldn't lose them, and those little plastic bags are around here somewhere. In just two days we've gone from having something that looked almost like a real car, to something that looks almost like a bare metal frame. Or exactly like a bare metal frame. 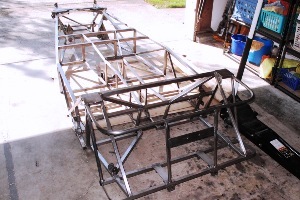 According to a lot of Locost builders, taking apart a rolling chassis is supposed to feel like a step backwards. Somehow we don't feel that way. We knew all along that we weren't assembling anything for the last time. We were just trial-fitting parts. We hope by now that we've trial-fitted most of them. All the work we've done to date has covered the first 12 chapters in the Locost book. The next chapter, called Final Assembly, starts out by saying at this point you should have a collection of parts very similar to the contents of a kit you could have purchased from one of the kit-car manufacturers. And that's exactly what this feels like. We've built a kit. A bunch of parts ready for assembly. And some paint. And bodywork. We've got a lot to do in the coming weeks to get the chassis ready for paint. We have sheet metal to attach, and also a few more parts to cut and fit. Things we need to weld on or finish up include the horn brackets, motor mounts, muffler hanger brackets, transmission mount, handbrake cable stop bracket, tube end plugs, coolant pipe bracket, and probably lots more. Maybe we'll come up with a checklist so we don't forget anything. Although we might forget to put stuff on the checklist, so we're not sure what to do about that.